As you drive or walk along the far eastern part of Rideau Street or cross the Cummings Bridge between Lowertown and Vanier, it is hard not to notice the magnificent mural that adorns the south wall of an Ottawa Community Housing (OCH) building at 215 Wurtemburg Street. Transformation: The Welcoming Ottawa Mural was officially unveiled at a ceremony on November 3. Outdoor murals can breathe life and character into the neighbourhoods of cities and often build community pride. What makes this stunning mural even more exceptional is the story behind it. This mural was inspired by Welcoming Ottawa Week, an annual series of events that conveys the city’s genuine hospitality to and appreciation of newcomers from all over the world who join our community every year and then become us. By representing Welcoming Ottawa Week year round, this mural is a reminder that immigration and our diversity build a stronger and more vibrant Ottawa. 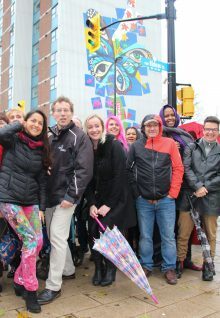 The concept of the mural, which includes a butterfly with wings made out of eyes represented in different colours, came about through many brainstorming sessions across the city, hosted by Claudia with residents from all walks of life. The volunteers involved in painting and varnishing the mural’s pieces originally come 32 countries. The mural development also benefitted from a special participation by Algonquin artists. 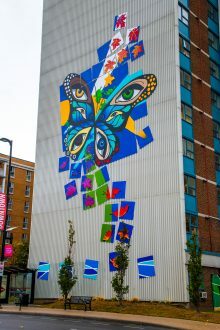 Barbara also tells the story of how when a tenant got off the bus at a nearby stop, she looked up at the mural and said with tears in her eyes that the butterflies are about transformation and that she could identify with that image in her own evolution. At the unveiling, Hindia presented Claudia with a Welcoming Ottawa Ambassador award for successful community engagement and collaborative production of Transformation: The Welcoming Ottawa Mural. “A special thanks goes to the lead artist, Claudia Salguero. 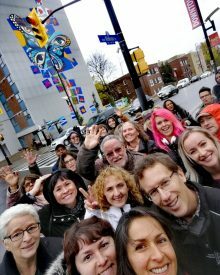 Because of her creativity, tenacity, hard work and unique ability to bring so many volunteers together from across the city, this mural became a reality,” explains Hindia. “The meaning of this project moves well beyond the neighbourhood where the mural lives, it’s about the idea of recognition; recognition of the values of hard work and determination that drive so many people to come from all parts of the world to join us every year” added Hindia. “Ottawa welcomes about 12,000 newcomers with dreams and a strong drive to succeed. The stories of the thousands of new people – of men, women, and children who join our community every year and the many transformative impacts their efforts bring to Ottawa’s growth and vibrancy remains largely untold. Thus Transformation – The Welcoming Ottawa Mural is a symbol of our collective recognition of newcomers’ contributions to our city,” concluded Hindia. In closing, Claudia spoke of how – even if for some reason the mural wouldn’t been installed, by painting it together the most important part of the project had been achieved. That is, what was discovered along the way, that everyone can learn from each other, grow together and ultimately be stronger. “I feel thankful for the trust and support received in bringing 64 people together to create something bigger than all of us,” says Claudia. The project was made possible thanks to a partnership between Ottawa Local Immigration Partnership, Ottawa Community Housing, the Tenant Circle at 215 Wurtemburg, and the Lowertown Community Resource Centre. The mural received funding from the City of Ottawa’s Diversity in the Arts Fund, as well as Crime Prevention Ottawa and Ottawa Community Housing.